Labels are there to let you know what’s in the food you’re buying and to help you make purchasing decisions based on the diet you keep. But labels can get confusing. To simplify it, we’re breaking down our Nakd Bar labels to explain everything you find on them. 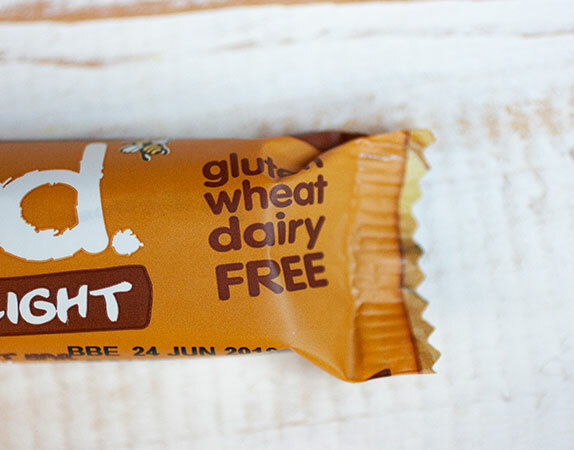 Nakd Bars do not contain gluten. Gluten is the name given to the protein found in wheat, rye, barley and tritacle (a cross between wheat and rye). Gluten isn’t only found in breads and pastas, it can be found in snacks, sauces and condiments. As Nakd Bars are made with just fruits and nuts, they are naturally gluten free and thus a safe option for anyone who has a gluten sensitivity, allergy or coeliac disease. Nakd bars do not contain any wheat. While all wheat products have gluten, not all gluten products contain wheat (barley is wheat free, but still contains gluten). This makes Nakd Bars the perfect choice for people with any wheat allergies including coeliac and gluten allergies. 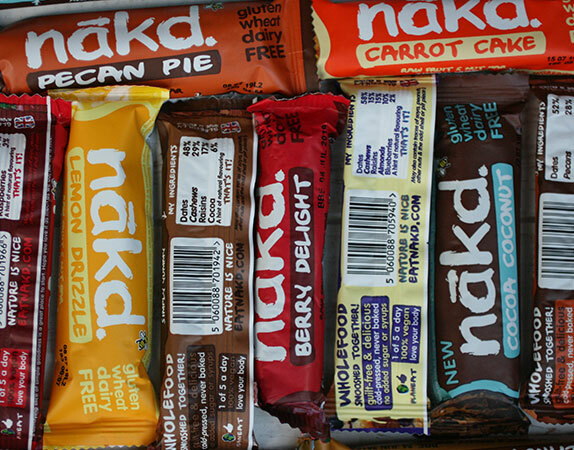 Nakd bars do not contain any dairy ingredients (and are not made on equipment used for dairy). This means they are good for people with a lactose intolerance as well as vegans. Nakd bars are made up of 100% plant based real ingredients, namely nuts and fruits which makes them naturally vegan. They’ve also been approved by the Vegetarian Society. This means that Nakd bars are suitable for both vegans and vegetarians. This refers to way the Nakd Bars are produced. They’re not a baked bar, rather the ingredients are cold pressed together to create a bar you love. You can tell by the texture, which is soft and chewy and not hard and crumbly like a granola bar. This means that Nakd Bars are suitable for people who follow raw diets. All the bars except for the Peanut Delight Bar would also be suitable for those following a paleo diet (as peanuts are considered a legume, they are not eaten on a paleo diet). 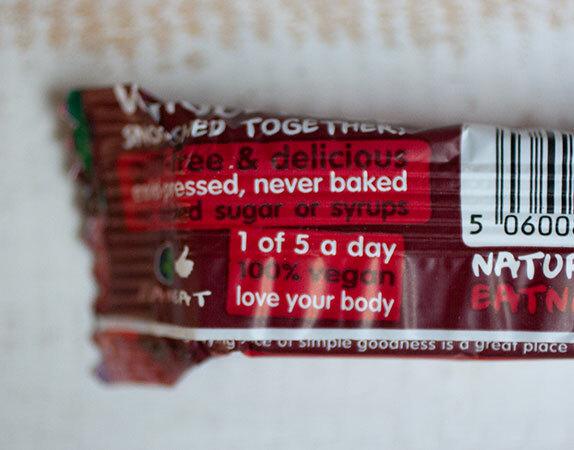 On each Nakd Bar there is an ingredient list which contains 2-6 ingredients. This is everything that goes into each bar. Most of these are fruits (like dates, raisins and blueberries) and nuts (like almonds, cashews and pecans). Occasionally you’ll see the words “a hint of natural flavouring”, this is simply all-natural flavours such as spices and extracts from ingredients like strawberries, raspberries, bananas, apples, nuts, cocoa, cinnamon, nutmeg, peanut, etc. This is the certification which makes all Nakd Bars Kosher. The KLBD stands for Kosher London Beth Din. 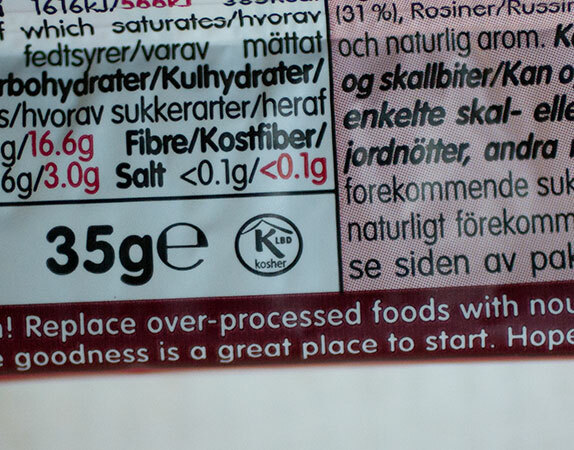 This means that all Nakd Bars are suitable for those who keep a kosher diet. On all Nakd bars except for the Peanut Delight, Pecan Pie and Cashew Cookie, you’ll notice they say 1 of 5 a day. This means that those bars count as one of your 5 servings of fruit and veggies a day. So, if you count your servings, you can include one Nakd Bar. Each nakd bar has a BBE in black with a date. 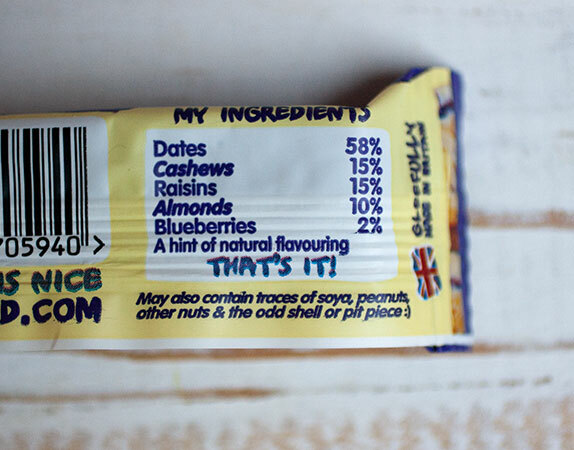 This is the last date you should eat the bars on. Nakd Bars have a good shelf life due to the naturally occurring sugars in the fruit which act as natural preservatives. In addition, each packet is sealed with extremely high-quality packaging that doesn’t let in any air and keeps the bars moist and yummy. However, because there are no added preservatives, Nakd Bars don’t last forever and that date needs to be kept to, to ensure your bar is safe to eat.